Goldenseal grows wild in parts of the United States, but it’s commercially farmed for use in supplements. Even though Native Americans used it to treat skin diseases and digestive problems, today it's primarily used as an antibiotic, reports New York University. While it contains active ingredients called alkaloids, there isn't enough scientific evidence to support its therapeutic use in people. One of the active alkaloids in goldenseal -- berberine -- has the ability to kill or inhibit the growth of bacteria, fungi and protozoa. In its summary of goldenseal studies, Memorial Sloan Kettering Cancer Center reported that berberine shows promise for inhibiting the growth of several types of cancer cells, including breast and prostate cancers. However, these are laboratory studies and more research is needed to see whether it may have the same effect in people. Standard dosage recommendations for goldenseal have not been established because of a lack of research, according to MedlinePlus. You're likely to see a wide range of doses and strengths in supplements. Drugs.com reports that doses typically range from 250 milligrams to 1,000 milligrams, taken three times daily. A tea made from steeping 0.5 gram to 1 gram of goldenseal root in a cup of water may work as a gargle to sooth mouth sores or a sore throat. Ten to 30 drops of extract taken two to four times daily may help treat influenza, according to Drugs.com. The American Cancer Society reports that it can be toxic or even deadly in high doses. 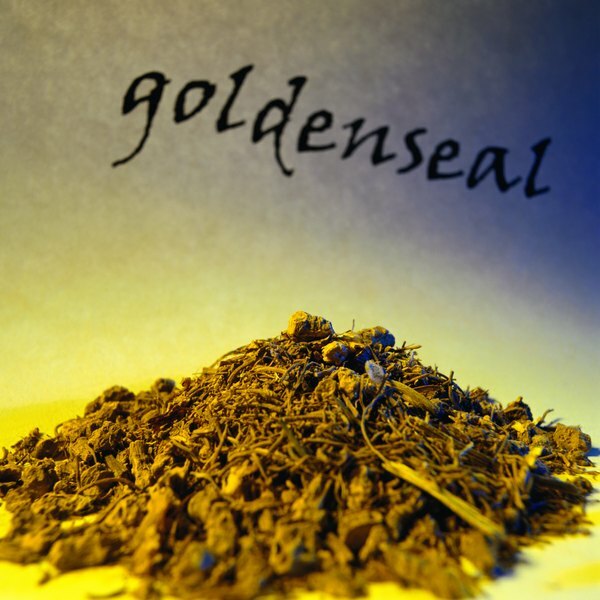 Goldenseal may interact with some medications and existing health conditions. Talk to your health-care provider before taking any form of goldenseal if you take prescription medications, have a heart condition, or you’ve been diagnosed with high blood pressure, jaundice, liver or kidney disease. Do not take supplements if you’re pregnant because they may cause uterine contractions. Potential side effects reported by the American Cancer Society include nausea, diarrhea, vomiting, constipation and stomach pain. Berberine in goldenseal is associated with an increased risk of liver tumors in rats and mice, according to the July 2013 issue of "Toxicology Letters."